"A professor of mine heard through his design network that a local bicycle company needed help developing a new top-secret project." says Ashton, recalling a fateful day for both himself and Mission Bicycle Company. After a long phone conversation geeking on bikes, design, and the psychology surrounding user behavior, he'd secured himself a job as our newest, finest, and only Product Designer. 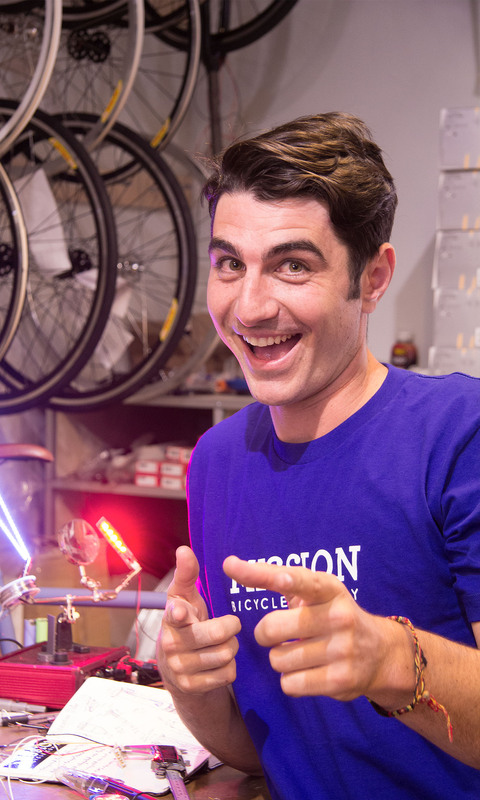 A native of the South Bay, Ashton was no stranger to San Francisco nor cycling when he packed up and moved north to complete his degree in industrial design. Taking a passion to bicycles at age 14, Ashton began racing mountain bikes competitively at 19. Fast forward to today and you can find him taking the podium at anything from Dual Slalom to Road. Not unlike a fine wine, his appreciation for two wheels has aged beautifully over the years and he still views it as the best way to explore new places, meet new people, and engage with the world around him. Serving as our in-house mad scientist would be no easy task to most, but Ashtons "challenge everything" attitude keeps the ideas coming in faster than we can catch them most days. It's a good thing. When he's not at the drawing board or hitting the trails, you can find him on our sales floor, where he's designed some of our most conceptual work to date. Ashton is the only Mission Bicycle staffer to take his first dates on a tandem bicycle to see if they are a keeper.